* Vocal Warm-ups – The director will lead a few vocal exercises to help you warm up your voice and establish a comfortable range. * Prepared Song – This can be a traditional folk song, art song or hymn, accompanied or a cappella. If you would like to be accompanied, please bring an extra copy of your music. * Sight-reading Passage – This will be an accompanied piece or passage in a comfortable range. The text will be in English, although you may also choose to sing on a vowel. * Discussion – There will be an opportunity to ask questions about the choir and the coming season. 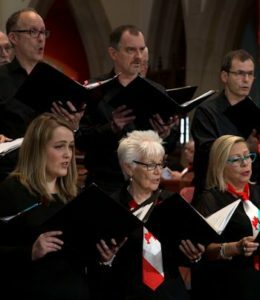 Please contact the Membership Coordinator at torontoannexsingers@gmail.com for further information and to schedule your audition, or fill out the Audition Sign Up form below. Underneath the Stars, June 1, 7:30 pm, Grace Church on-the-Hill: Moonbeams and stardust light up our final programme of the season — a cabaret concert of jazz standards and popular songs on the theme of celestial night. Selections by Gershwin, Porter, Berlin and other Songbook luminaries.